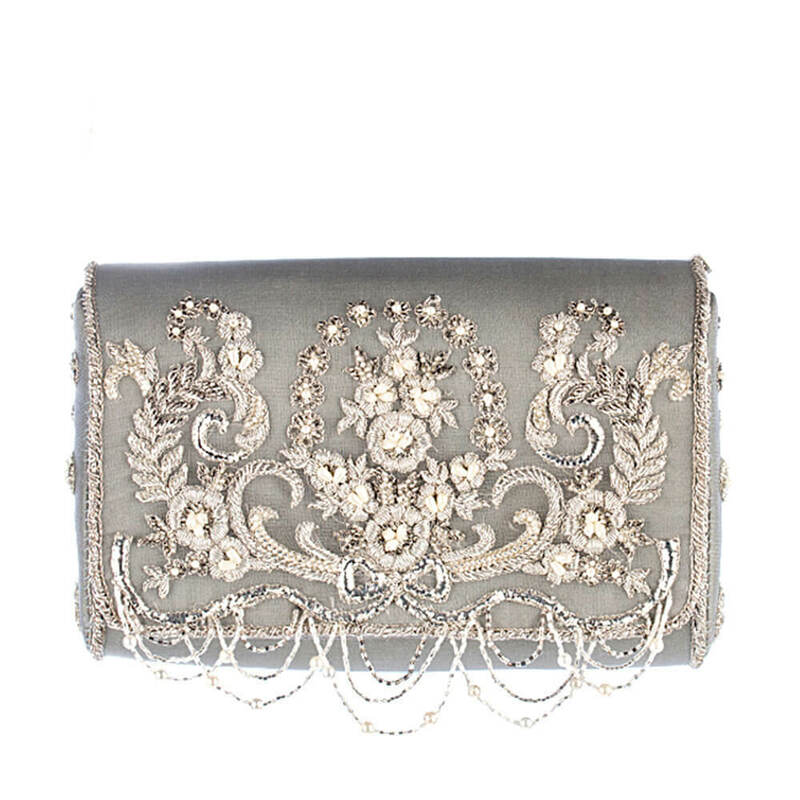 Any ColorCOLOR: ChampagneCOLOR: Dove Grey.COLOR: Gold.COLOR: Silver. 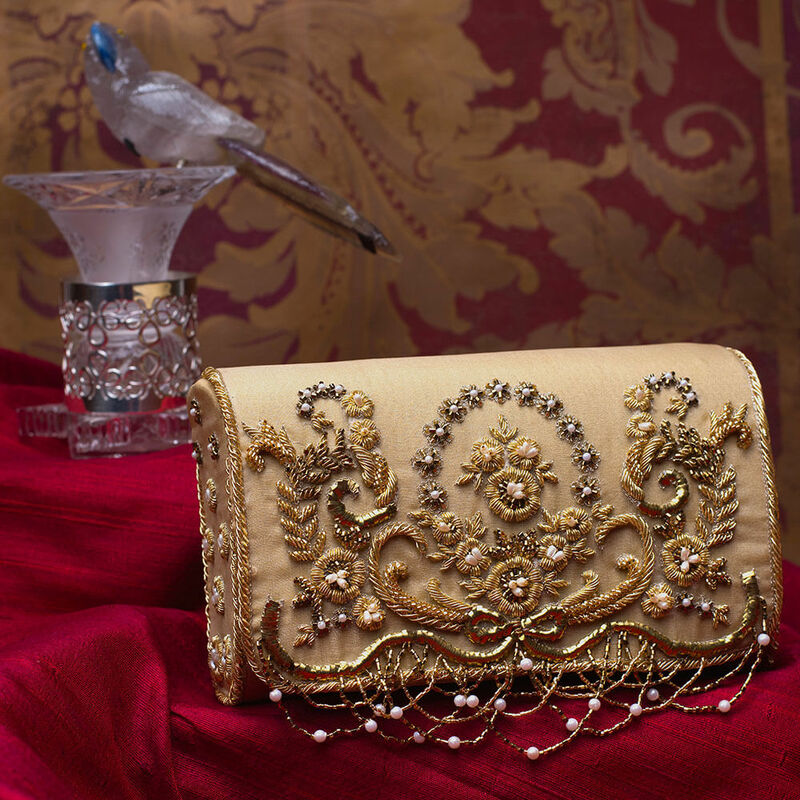 Inspired by the opulence of the golden period in French history called La Belle Epoque, this box clutch is intricately hand embroidered with sublime bugle beads,cultured drop pearls and fine gold and silver threads. 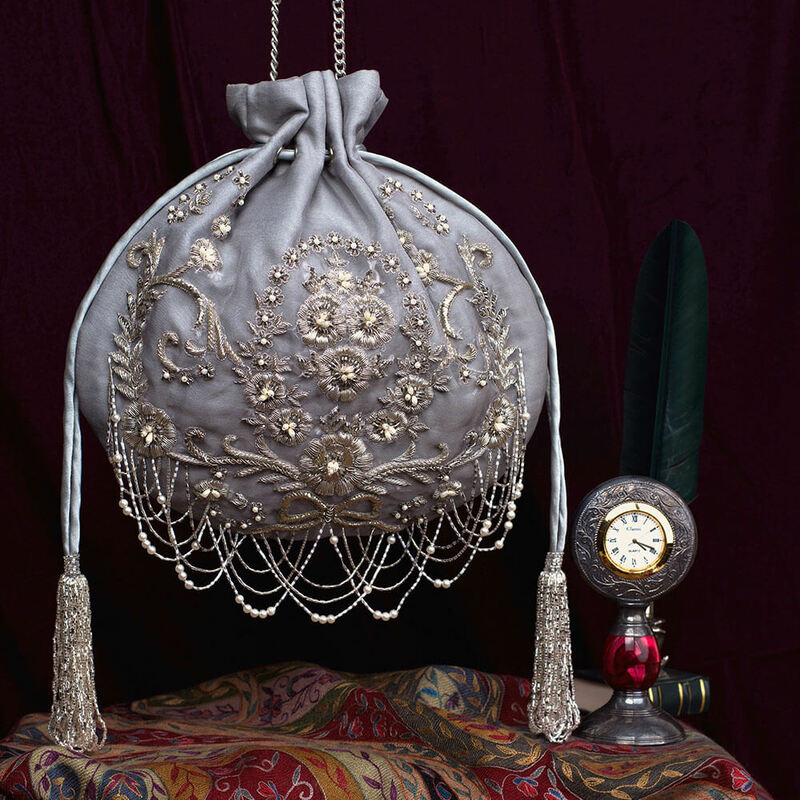 It has handcrafted chandelier like tassels , a suedette lining and a long chain handle.Color: Dove Grey. 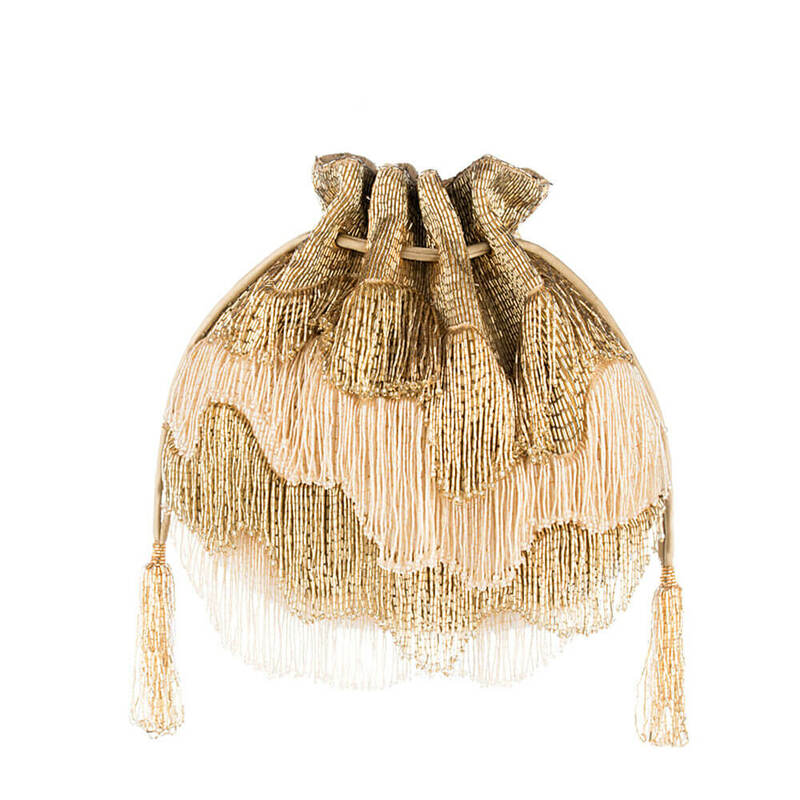 CARE: Store in dust bag. Keep away from moisture. DIMENSIONS:20 cm x 11 cm. 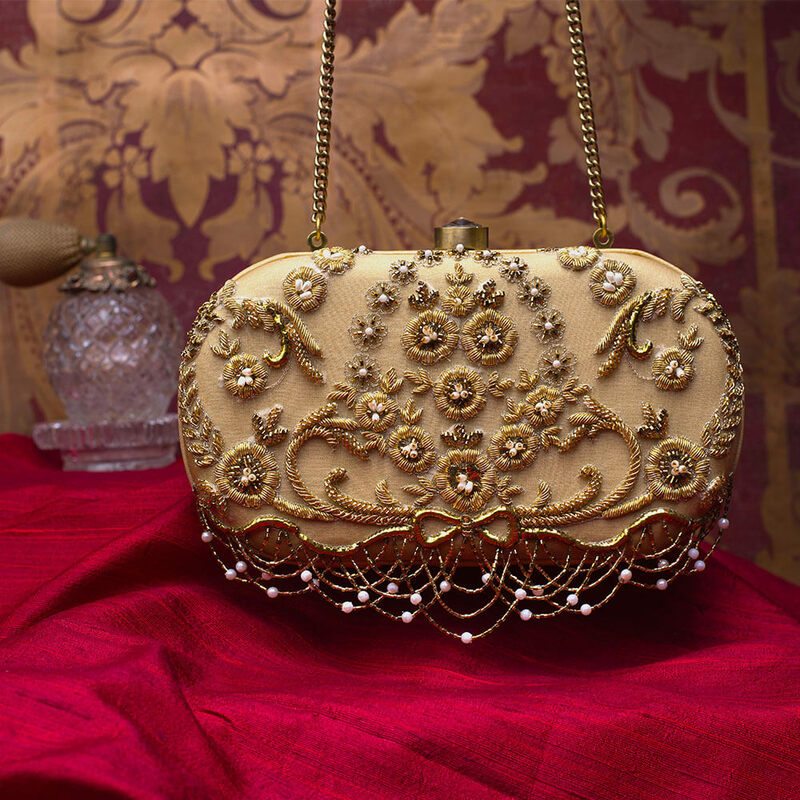 Inspired by the opulence of the golden period in French history called La Belle Epoque, this box clutch is intricately hand embroidered with sublime bugle beads,cultured drop pearls and fine gold and silver threads. 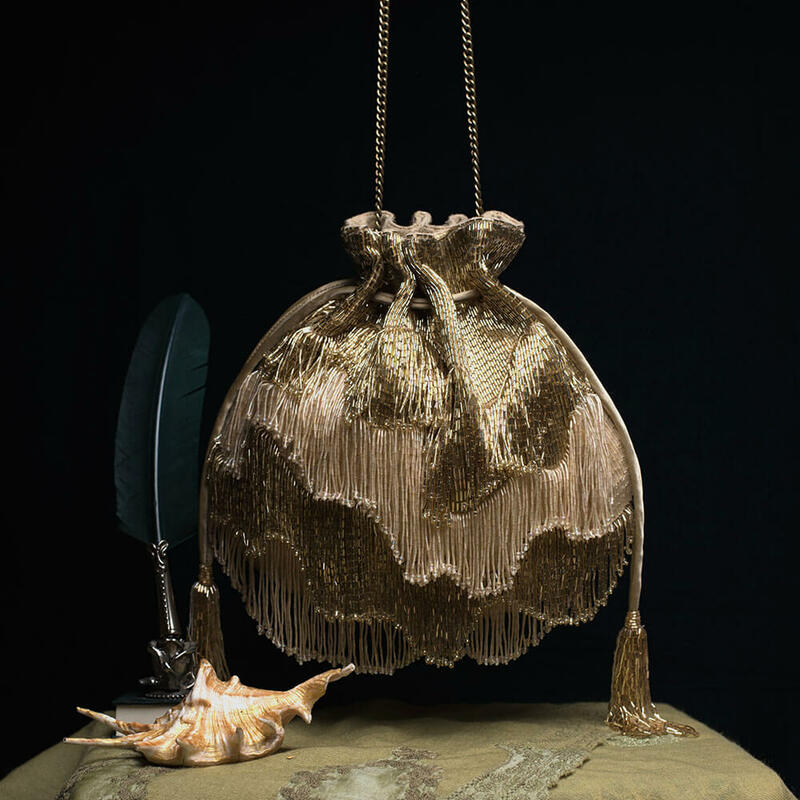 It has handcrafted chandelier like tassels , a suedette lining and a long chain handle.Color: Champagne. CARE: Store in dust bag. Keep away from moisture. DIMENSIONS:20 cm x 11 cm. 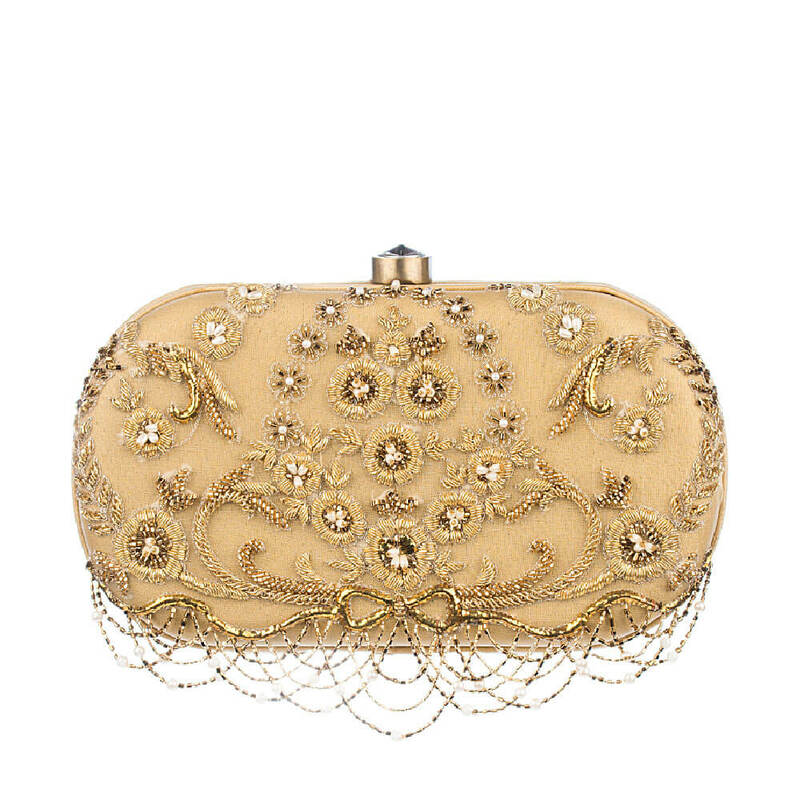 Inspired by the opulence of the golden period in French history called La Belle Epoque, this flapover clutch is intricately hand embroidered with sublime bugle beads,cultured drop pearls and fine gold and silver threads. 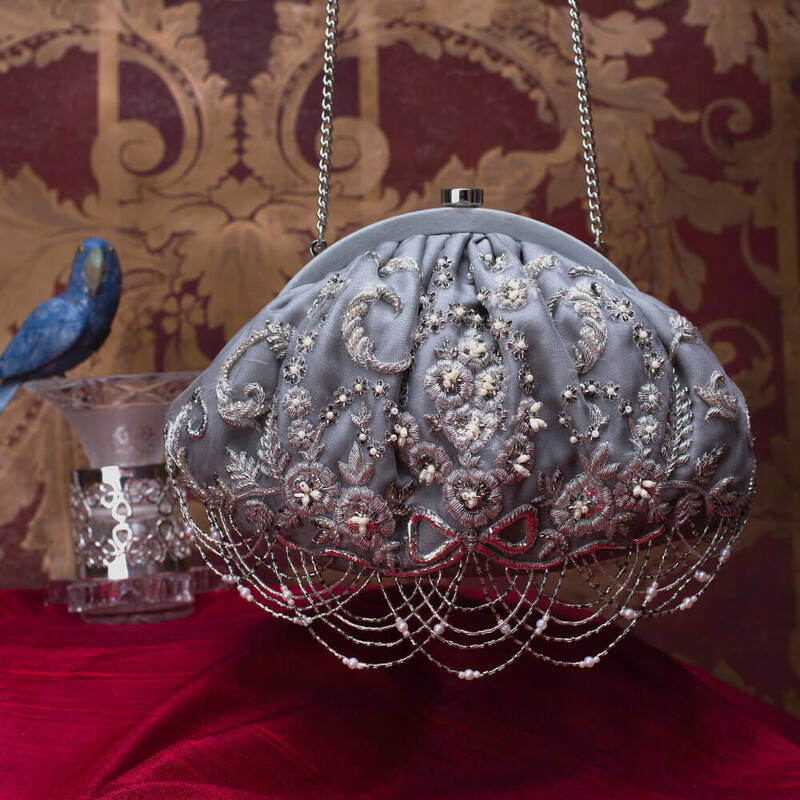 It has handcrafted chandelier like tassels , a suedette lining and a long detachable chain handle.Color: Dove Grey. CARE: Store in dust bag. 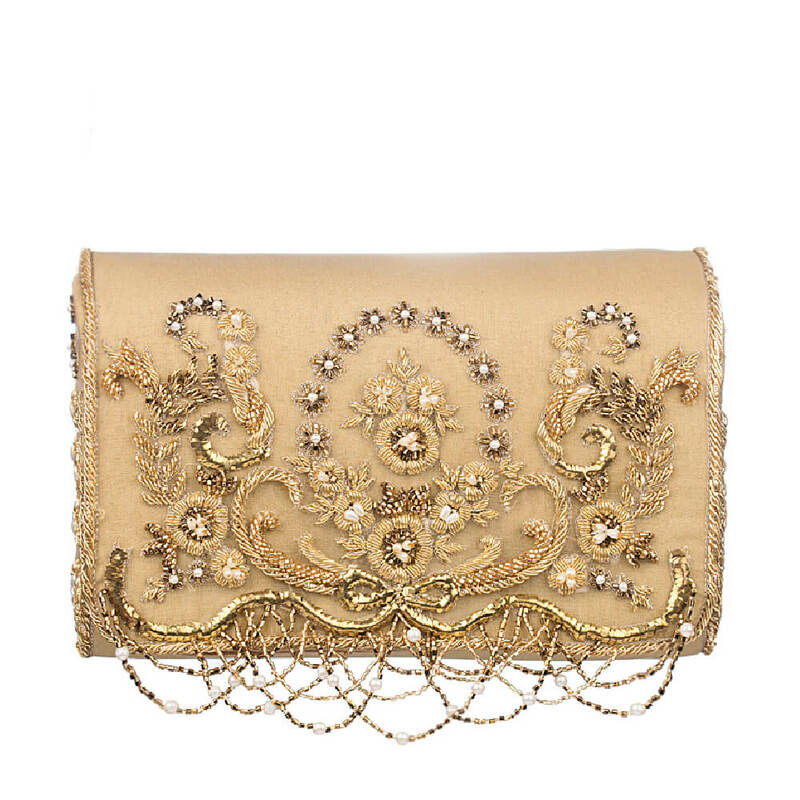 Keep away from moisture.DIMENSIONS:18 cm x 13 cm x 7 cm. 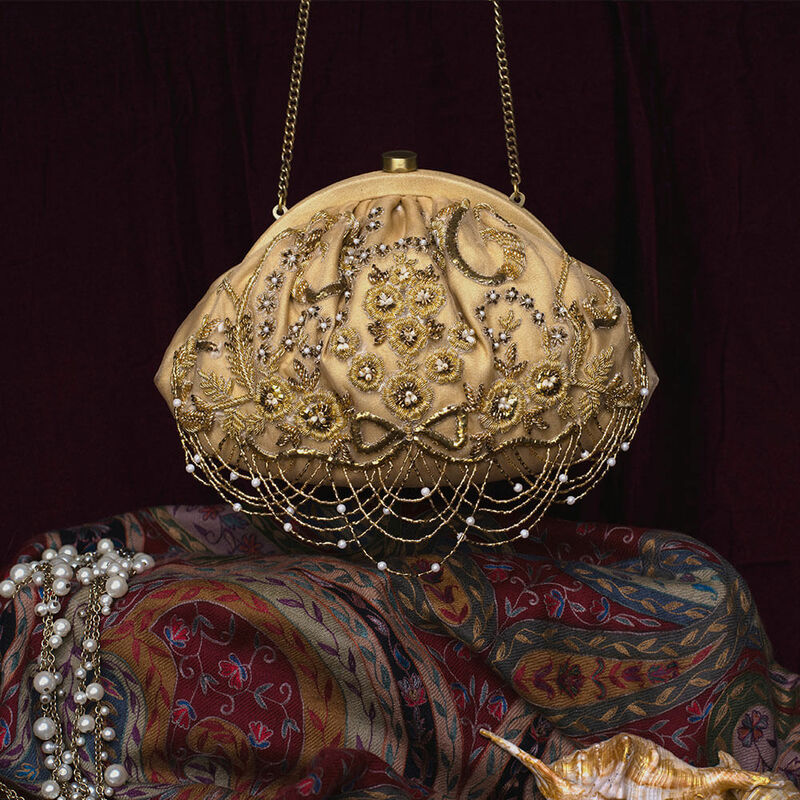 Inspired by the opulence of the golden period in French history called La Belle Epoque, this flapover clutch is intricately hand embroidered with sublime bugle beads,cultured drop pearls and fine gold and silver threads. 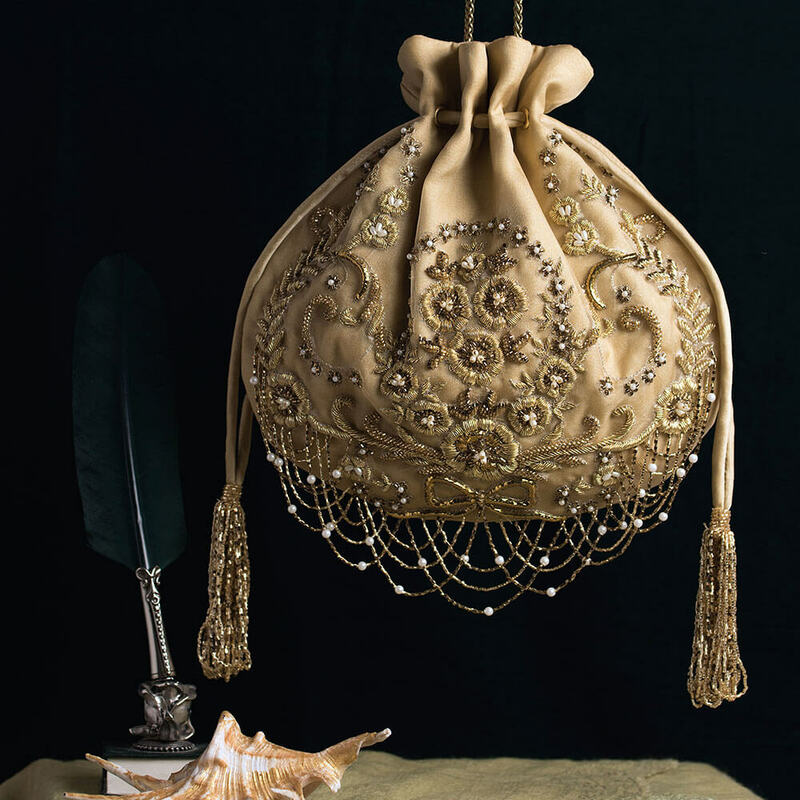 It has handcrafted chandelier like tassels , a suedette lining and a long detachable chain handle.Color: Champagne. 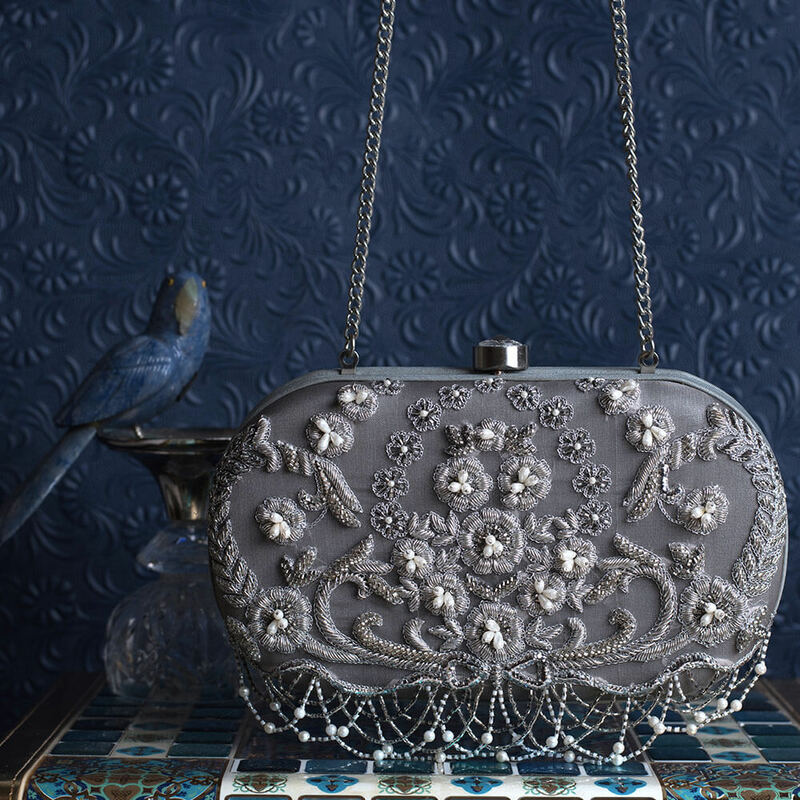 CARE: Store in dust bag. 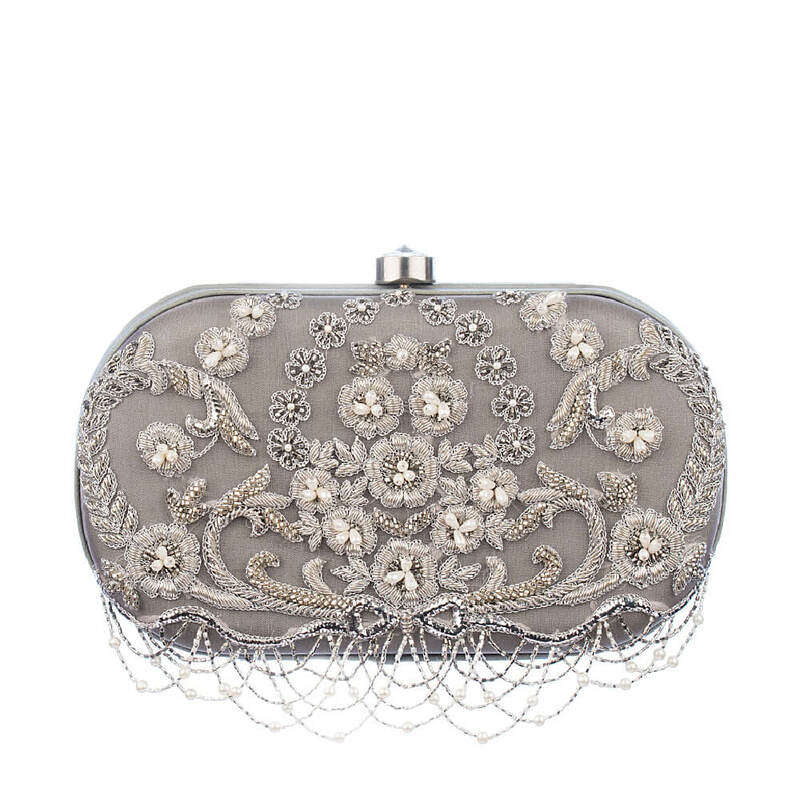 Keep away from moisture.DIMENSIONS:18 cm x 13 cm x 7 cm. 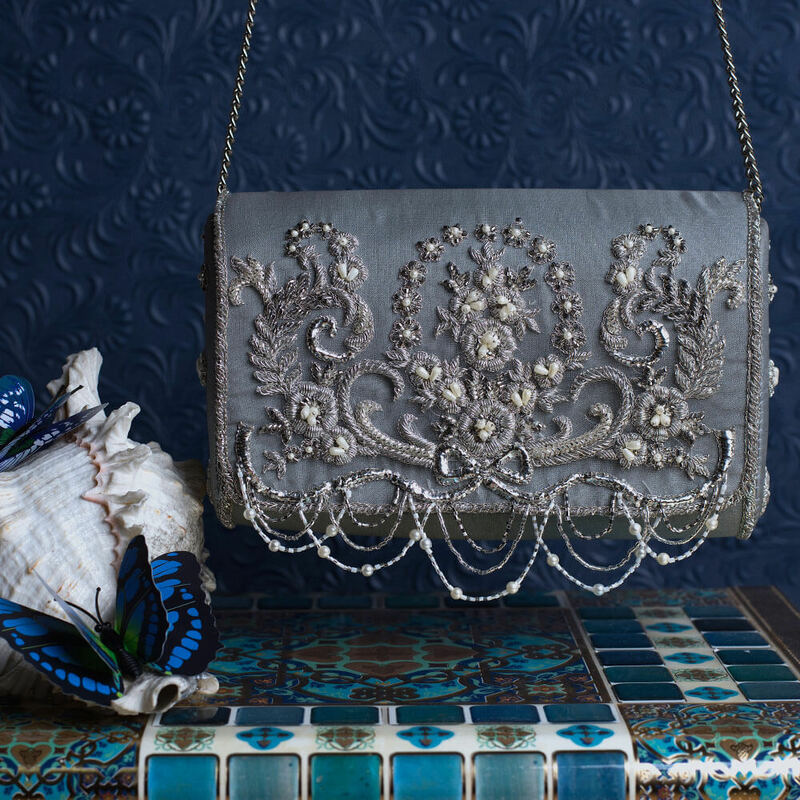 Inspired by the opulence of the golden period in French history called La Belle Epoque, this pouch is intricately hand embroidered with sublime bugle beads,cultured drop pearls and fine gold and silver threads. 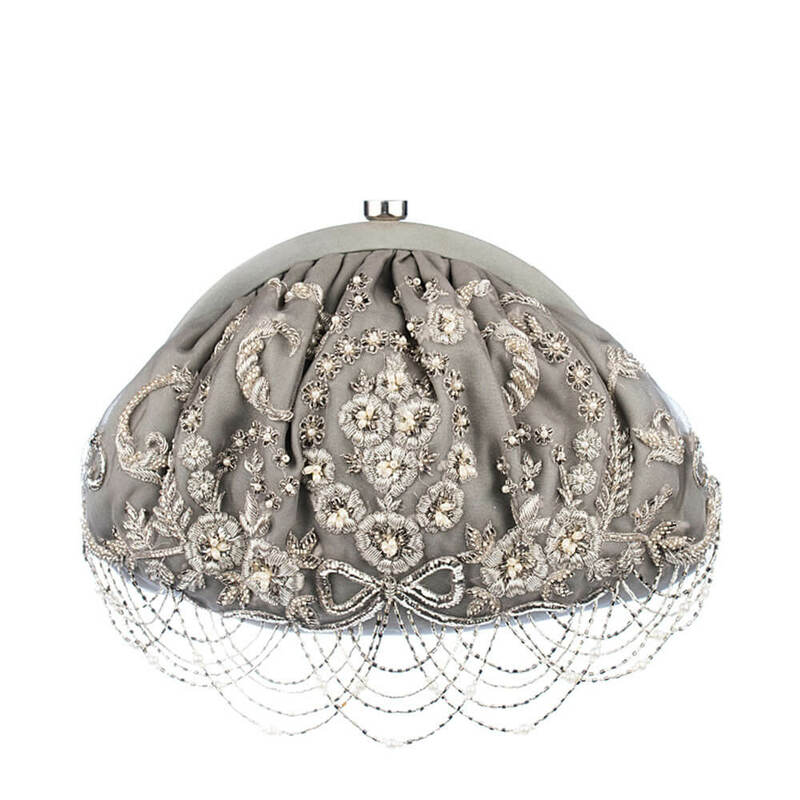 It has handcrafted chandelier like tassels , a suedette lining and a long chain handle.Color: Dove Grey. CARE: Store in dust bag. 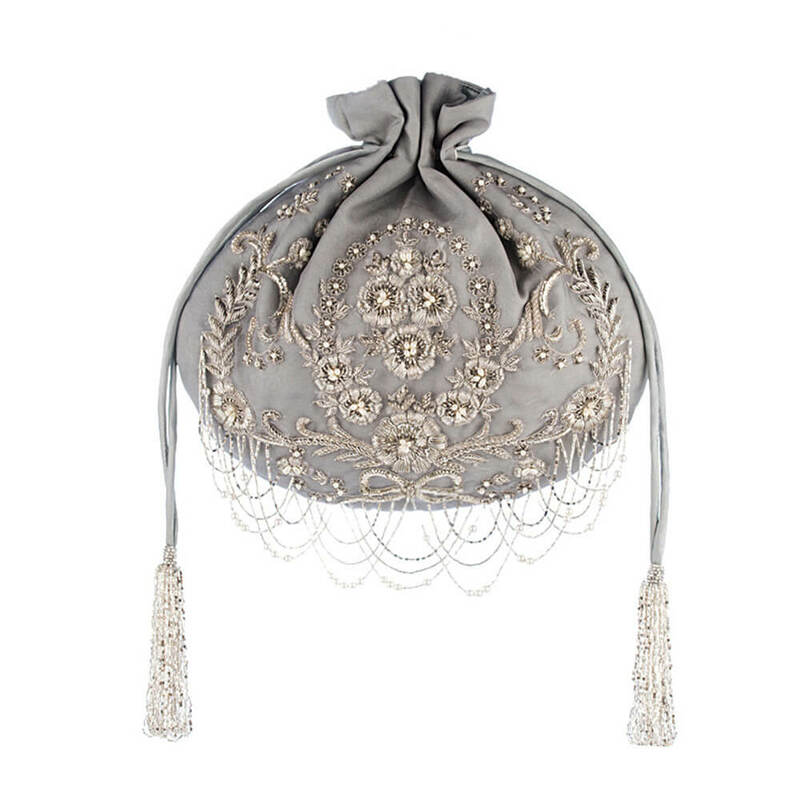 Keep away from moisture.DIMENSIONS:26 cm x 16 cm. 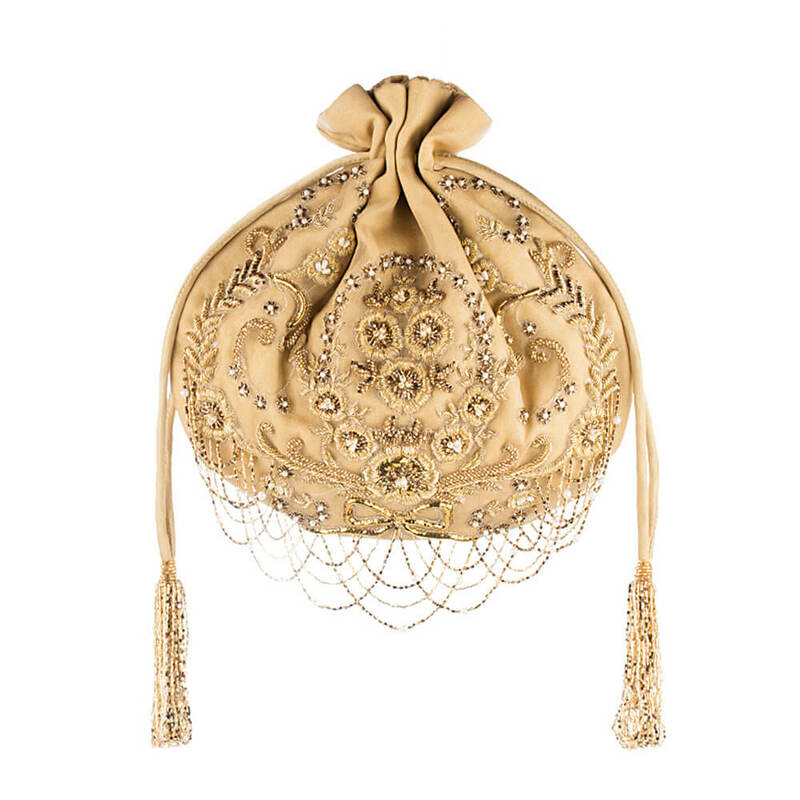 Inspired by the opulence of the golden period in French history called La Belle Epoque, this pouch is intricately hand embroidered with sublime bugle beads,cultured drop pearls and fine gold and silver threads. 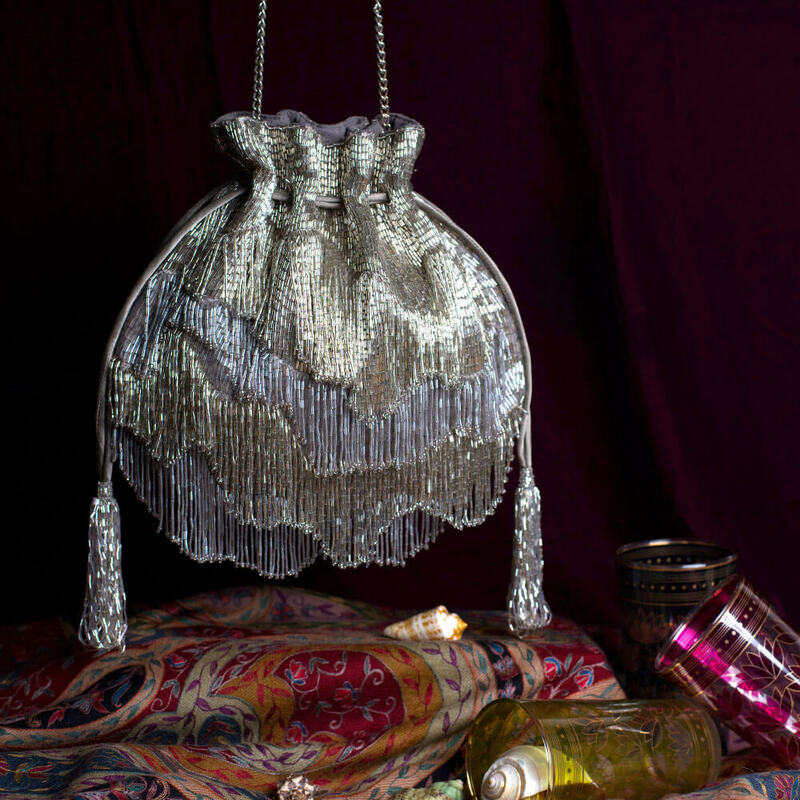 It has handcrafted chandelier like tassels , a suedette lining and a long chain handle..Color: Champagne. CARE: Store in dust bag. 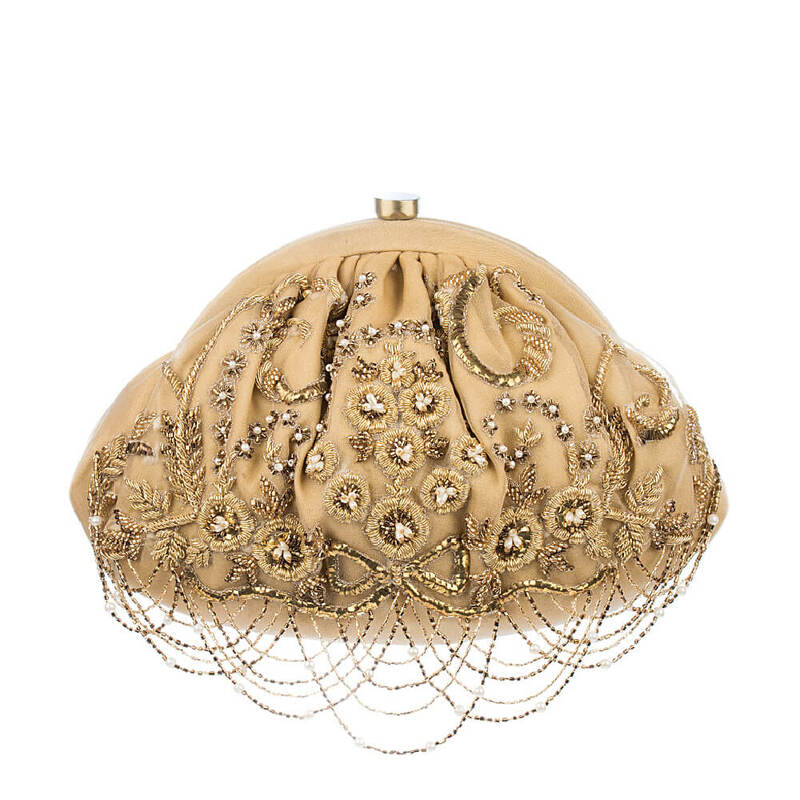 Keep away from moisture.DIMENSIONS:26 cm x 16 cm.